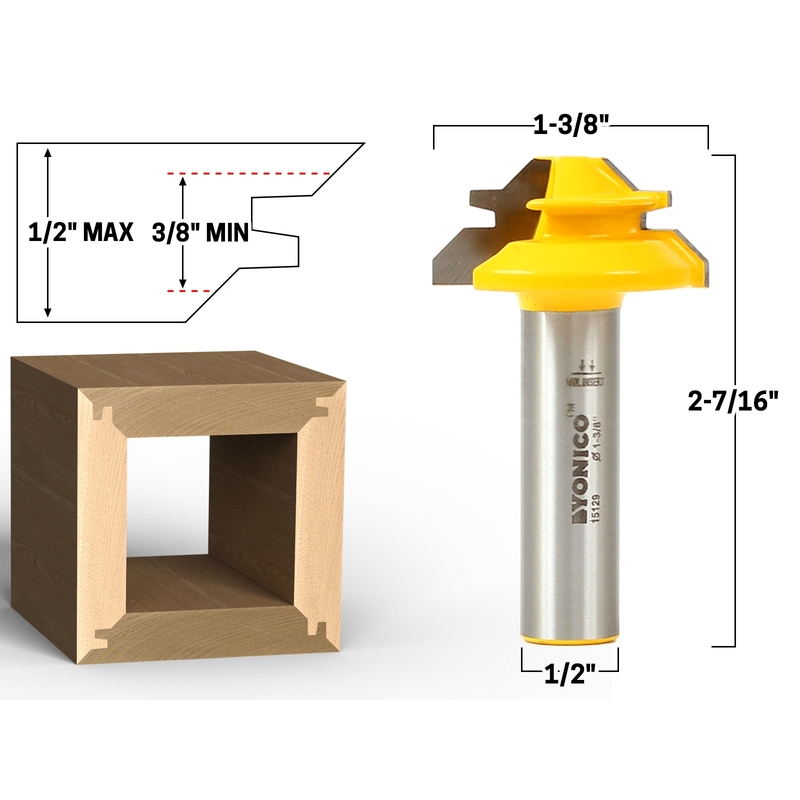 Use the Yonico 15334 - 45° lock miter Router bit set to join boards at 90°. The interlocking 45° miter lock cuts will produce extremely strong joints without having to struggle to keep boards in place during clamping. Additionally, lock miter cuts will provide extra gluing surface resulting in an extremely strong and durable joint. The Yonico 15334 lock miter bits set is reversible. When positioned properly, one miter bit will cut both pieces of stock without having to adjust the bit. With fence in place, set the center of the stock to the center of the miter bit. Then, cut one piece of stock horizontally and the second one vertically. 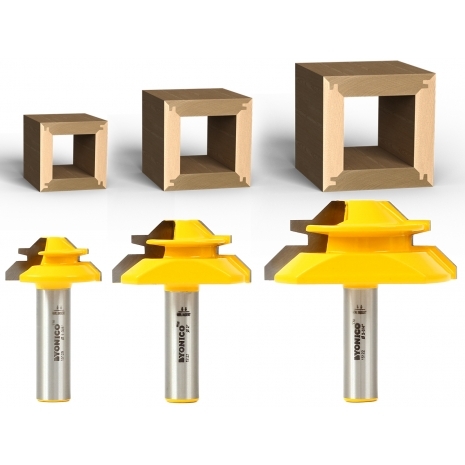 The Yonico 15334 lock miter set includes 3 of the most popular lock miter bits for a range of stock sizes. 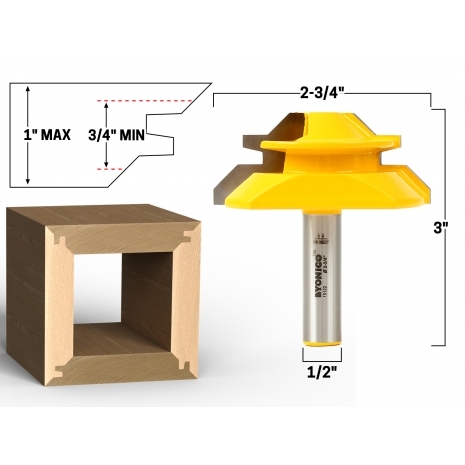 The largest miter lock bit has a 2-3/4" diameter and is suited for up to 1" thick stock. 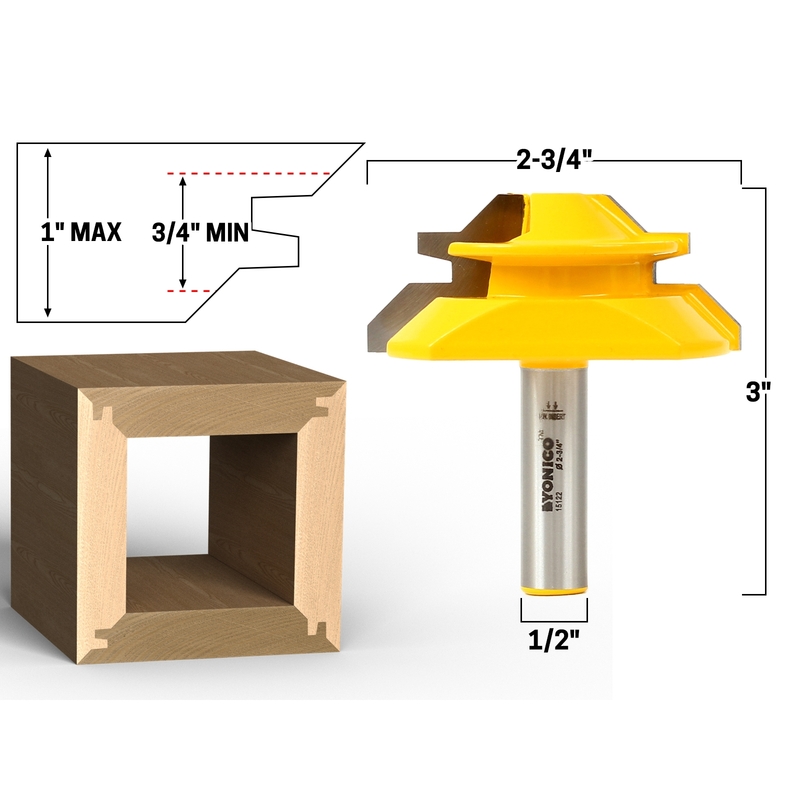 The medium sized lock miter router bit has a 2" diameter and is suited for 3/4" stock. The smallest miter lock bit is 1-3/8" diameter and will work best with 1/2" stock. Two flute carbide router bit cutters and 1/2" shanks. Set comes in a solid wood storage case. Use the reversible 45° lock miter glue joint router bit to join boards at 90°. The interlocking 45° cuts will produce extremely strong joints without having to struggle to keep the boards in place during clamping. Additionally, it will provide extra gluing surface resulting in an extremely strong and durable joint. It can be little tricky at first but when positioned properly, the bit will cut both pieces of stock without having to adjust the bit. Align the center of the cutter with the center of the stock when the stock is in the horizontal position and in the vertical position. Then, cut one piece horizontally and the second one vertically and the joint should line up perfectly. Instructions are available from the manufacturer upon request. Note: Lock miter bits only work properly on solid wood. MDF and plywood are not recommended.